More babies were born in England in 2010 than in any year since 1972, whilst births to women aged 30 or older were at their highest since 1946. The NHS is desperately short of midwives, and the shortage affects every region of England. We need urgent action from the Government, including a target to recruit the equivalent of 5000 more full-time midwives. Care for women but especially babies at the very start of life should be shielded from the cuts. This is an e petition to H M Government. I would have worded it differently, but there again I am a simple being who would just go to the heart of the problem. The whole world, literally, interprets the current staffing issue within the maternity services as being down to a shortage of trained midwives but that isn’t the situation, there are plenty of us. The issue is the employment of midwives, and the crux of the matter is funding. The Trusts are having to budget so harshly that coal-face staff numbers are being trimmed to below the quick, and not just midwives, other professionals as well. We do need to recruit more midwives but to do this we need to improve the funding, be shielded from the cuts yes, but also improve the monies available to the maternity services, not for paper-shuffling exercises but to employ more midwives. Anyway, here’s the link, it can’t do any harm so please sign the e petition here. Over the past few years there has been an escalation in the erosion of the midwifery care provided at home after birth. I have complained, wrung my hands, and generally played the prophet of doom about the impact this could have but, unfortunately, postnatal care is the easiest way for Trusts to cut staffing costs so the resources for this area have been torn away with relief by struggling maternity services. It is the area less likely to produce litigation, and the area where any successful litigation would probably decide on far smaller awards to the claimant so, in the mind of a budget holder, is the safest area to cut services back to the bone. I was at a governance meeting a while back where the topic of community postnatal care came-up, and I was surprised to hear a consultant midwife back the reduction in care whilst supporting her approach by mentioning ‘a study in the Netherlands’ which found no difference in outcomes between those who had care at home after birth and those who didn’t. Well, I think I’ve found the study, Costs and effectiveness of community postnatal support workers, and if this was the study then she was in error using it to support the discussion as the visits by midwives were not changed, more and longer visits were provided by maternity support workers. Well, today I learned that there is to be a study conducted initially in Scotland by Sterling University into postnatal care. Am I hopeful it will be a positive thing? Not really as I’m not entirely sure that it will be woman centred. At the moment all I have to go on is the BBC report,and whilst I love ‘Auntie’ I am aware that reporting on this topic, maternity care, is not always accurate so I’m just going on their take on the information. What concerns me is that NICE have already issued their guidance on Postnatal Care, which Trusts have interpreted to mean that care is taken away from the home and provided at clinics and this study are also going to ‘develop a best practice package’… ‘which individual health authorities could then adapt to their needs’, (their needs being to cut costs). I will be interested to read their results but I’m really not going to hold my breath. My previous musings on this topic include; Letting women and babies down? (2010); The Demise of Community Midwifery – part 2 (2010); What now? (2009); A step backwards (2008); An embarrassment (2007). When reading these offerings prior to linking it was interesting (depressing) to chart the real demise of the postnatal care provision in my area, especially my ’embarrassment’ at the care I was not providing in 2007 when we were still visiting at home. Now we ‘triage’ on the first day home and basically, if the woman answers all the questions on our pro forma correctly, she won’t get to see a midwife until Day 5, and then the likelihood is that it will be at a clinic, one of which is 12 miles away. I’m not embarrassed now, I’m ashamed. I know that you, your government, the country, need to cut spending. I would know that because my wage packet has already been adversely affected, I accept that and don’t believe that public sector workers should be immune from ‘cuts’. Please note that I have said ‘public sector workers’, not ‘the public sector’. I can’t comment with any degree of authority on the majority of publicly funded institutions but ask me about the maternity services and I can go on for hours, if not days, perhaps even weeks, you see I’m an NHS midwife, and have been for many years. At this point I could make lots of self-invented comparisons between the effects of cost-savings within education, policing, parks etc., and the maternity services but they would be trite and not substantiated so, I shall just go straight to the heart of the matter, if you adversely affect the budget to the maternity services it will cost lives. Lives of Mothers and babies. Please don’t interrupt me at this point and say ‘there will be no cuts in the NHS’ as that is plainly untrue. You seem to believe that is true but let me tell you now, cuts are being made, huge cuts are being made within the maternity services. Back to my diatribe. The cuts. I work on the community and in an effort to reduce expenditure staffing at the weekend has been reduced by 50%. How has this been effected? Clinics have been set-up at the maternity unit and postnatal women, even those 5 days following a caesarean section, have to come to us. Inconvenient for them, especially if they have other children, and also, due to an appointment system, not practical for giving breastfeeding support. It’s also pared down to the marrow the on-call system, at a time when your government has stated that it supports a woman’s choice for homebirth. 2 midwives on-call on the Friday night who are scheduled to work Saturday and cover the clinic. They get called out all night and so are not working the Saturday, that leaves 2 midwives who are on-call for the Saturday. See where this is going? Yes, they get called mid-morning and wham, bam, no midwives. Homebirths are not the only occurence which can show how stupid, short-sighted and negligent the staffing is at weekends, wish they were but thanks to budgetary constraints community, on-call midwives are also called in to cover the consultant unit and the stand-alone birth unit. Yes, due to the cost-savings ‘bank’ staff are no longer ‘allowed’ to be used to cover absence or staffing shortfalls so on-call midwives are summoned to fill in the gaps. Yes, midwives who have already worked a full day are then called in to work all night. The truly amazing thing is that they have been called out because the hospital midwives can’t cope as it is busy so they are entering a stressful working environment when they are already tired. Do you believe that is safe? Safety. Let’s consider some recent news items about the maternity services. What do you think Mr Cameron, are you happy with the care being provided by the maternity services? Do you really believe that they are not being adversely affected by a funding deficit? How about the rumours of over 200 midwives in Birmingham being forced to reapply for their jobs in an effort to save money by downgrading them. What do you think that will do for for retention? I sympathise with the position the government, and the country, finds themselves in now, I appreciate that savings have to be made. With regard to the maternity services though you have to be honest. Either you stand up and admit to the public that the quality of care is being adversely affected by budgetary constraints or you effectively ring-fence the budget for their maternity services and ensure that those services are not subjected to, what are in reality, ‘cuts’. Life as a midwife can be unpredictable but we are always aware on community when it will be busy, just a shame that we can’t be certain which days will be manic and which will just be non-stop. March was a ‘quiet’ month visit wise which was fantastic, we could catch-up with all those add-ons which are mandatory but not time sensitive, however antenatally it was busy. Oodles of pregnant women at the stage of their pregnancy when they start having 2 weekly midwife appointments, if we hadn’t got records showing that a baby boom should be expected in April/May our antenatal clinic’s would alert us to it. I dread busy clinics, something has to suffer and what I end up minimising is the ‘chat time’. I have to fill in all the paperwork demanded for audit, stats designed by my manager, work timings by the PCT and that’s not even including the woman’s notes and inputting consultation info onto the G.P’s computer. Midwives have been warned that if we fail to submit the bureaucratic paper mountain, ‘stat’, then our pay will be delayed. To me, having the time to sit and talk to my women is often as important as completing their notes, issues we discuss then and any worries they might communicate when they are relaxed can be vital. Having to fill in forms as if they are going out of fashion (wish they would) and hustle women out of the consulting room leaves me feeling as if I am shortchanging the women and not fulfilling my role of being ‘with woman’. The answer to reducing much of a midwife’s paperwork duplication would be for us to have notebooks or laptops, no, too expensive. Pathetic, shortsighted attitude. All our managers have Blackberry’s, even though they spend the majority of their time in a office, next to a telephone and with their ‘own’ PC in front of them, plus a secretary. Out on community we have 5 chairs in our office, 2 telephones and one PC, most days there are 6 midwives in the office and on some days there also 6 students. Community midwifery has been in existance for 70 years but it operates as if it is a new concept, an add-on which is not considered worth funding, but who does all the initial maternity bookings? Who provides the majority of antenatal and postnatal care? Who is responsible for identifying vulnerable families and liasing with social services and other agencies? Can’t speak for other areas but locally it is the community midwife, the hugely underfunded element of the maternity services where paperwork, even if it has the capability of detracting from patient care is paramount and he area where, when there is a time-saving option which could allow patient care not to be affected, it is dismissed as being too expensive! This Saturday, 26th of March. This is a major chance for us to show our opposition to cuts to healthcare services for women and the newborn. Please join us and bring your colleagues, friends, families and supporters in your community. We hear from the TUC that over 60,000 people are planning to attend. This will be the largest demonstration for many years. It is important that midwives are seen and heard with other public sector workers. Looking at the mothering, pregnancy, childbirth forums reveals a fair number of members posting the question ‘I’ve got my first visit with the midwife, what will happen?’. I’m going to answer that now, sort of. My slight hesitation is due to the vagaries of how care is provided, everywhere has slight, in some cases major, differences but the interchange of information between the midwife and the pregnant woman will remain the same. Remember that you are entitled to paid time off work for all appointments associated with your pregnancy. So, you and the midwife have arranged to meet, you are between 8 – 12 weeks pregnant, expect to spend at least 45 minutes on this meeting. You may have been provided with a pack containing booklets and leaflets prior to the meeting, make sure that you have read them as they may provide you with important information about local maternity units, screening tests, diet etc. 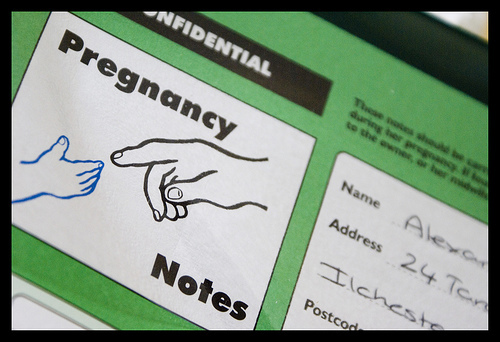 The pack may also have a blank copy of your maternity notes, if it does then you can make a start filling them in with your name and other personal details. Having read through the information make a note of any questions you want answers to and also any concerns you may have. Right, so you meet the midwife. She will have lots of questions for you; your previous medical history; about any previous pregnancies; your close family’s medical history regarding diabetes, high blood pressure, miscarriages, stillbirths and also baby’s born with hereditary conditions, abnormalities some of this will also be about baby’s father. Other questions will be about work, alcohol, smoking, recreational drug use, ethnic origin, contact with Social Services and, obscurely, highest educational qualification. At some point screening for Downs Syndrome will be mentioned. The midwife will ensure that you understand all about the tests available and how to access them if you want the screening. Some areas arrange these for you and some will provide you with the necessary numbers to call. Screening should be available to all on the NHS, you should not have to pay. The midwife will also explain about the blood tests we feel are necessary during pregnancy, she may ask if she can take the blood at this time. There will also be a discussion about where you would like to have your baby, what facilities are offered and the possibility of using a birth unit or having a home birth. Having listened to your health and social history the midwife will assess how your care will be provided, whether at this time you fall into the group classed by the hospital as low-risk or whether you need to be seen by an obstetrician. Whichever group you fall into, by the time the midwife leaves you should know the plan for your care and where and when you need to be seen during your pregnancy. At this early time it is difficult to be exact, the midwife can only guesstimate to within 2-3 week windows when the scans will be, and who knows when the consultant appointment will be if you need to see them but she will write down the weeks of pregnancy when you need to be receiving antenatal care and how the appointments are made for these. Information will also be given about the local provision for parentcraft/antenatal classes and contact details given for accessing them. You will also be given the contact details for your midwife and/or her team plus all the local maternity unit numbers.Other topics will include your employment rights during pregnancy, diet, exercise, domestic violence and smoking cessation, you will also receive your form which entitles you to free prescriptions during the pregnancy and until baby is 1 year old. Data protection will be highlighted and the fact it has been discussed will be recorded. I do not discuss labour at this point if it is the first baby but I do cover it following attendance at parentcraft classes and as the end of pregnancy approaches but some midwives may talk about it at this time. The midwife may test your urine at this time and in some areas a urine specimen will be sent off to be screened for underlying infection. Your blood pressure will also be recorded, along with your weight and height and your BMI calculated. Listening to baby’s heart? Highly unlikely before 12 weeks as baby is still very small and is hidden down below the pubic bone. By the end of this you may well be suffering from information overload but don’t worry as the midwife will have written everything down in your notes and/or left you leaflets about different topics so you can recap at your leisure! Here is a link to the NICE Guidelines on Antenatal Care which provide the basis on which your care will be organised. Thank you to those who voted/responded to my request for opinions, the results seem to echo the findings by professional surveys in that the majority considered the same midwife throughout labour to be of most importance. To be honest I was expecting that this wouldn’t be the conclusion. From my perspective as a woman giving birth, I couldn’t have cared who was there, as long as s/he attended to my needs, was competant and treated me like a real person and not just another ‘case’. It does throw up dilemmas though, we are supposed to be aiming at ‘one-to-one’ care during labour, but that doesn’t mean same midwife throughout, it just means that one midwife is only caring for one woman at a time. To then move to one-to-one care by the same midwife throughout is really throwing down the gauntlet, not sure how that could work even with a ‘domino’* system. There are days off, annual leave, sickness etc. and then there is the length of labour itself. Anyway, it has certainly left me with more than enough to ruminate on! * Domino – The midwife who has provided throughout pregnancy then accompanies the woman to hospital and stays with her until after baby is born. I have been laid low by yet another tooth abcess, according to my dentist it is down to grinding my teeth, something I am doing a great deal of recently. Working, whilst coping with tooth throbbing and jaw and ear aching, plus unable to take the pain-killers I yearned for was difficult but I am eternally grateful to one of our healthcare assistants who appeared at my clinic and helped it run to time by doing all the non-midwifery stuff. There is a box of choccies waiting for her to acknowledge her thoughtfulness toward a flagging colleague. I have a Google alert set up to notify me of news articles, blogs etc which mention ‘midwife’, it also alerts me to posts on sites like Mumsnet where members have included ‘midwife’ in the title. On occassion I have rsponded to threads, generally to give advice but this week I read a thread which, at first, I was just sad about as the woman was not happy with her midwife. Then I read the replies, and I got really irritated by the tone of some of the respondants. What I should have done was clicked away from it but instead I put fingers to keyboard and fired off a reply (I blame the toothache). They gave as good as they got, the original author amended the title, but the tone was still so unsettling from some that I wish I hadn’t done it. It really makes me realise how little people understand the struggles within the maternity services now and are happy to keep demanding more from an already close to disintegrating system. Memo to self, don’t read these sites, and if you do think once, think twice before replying.